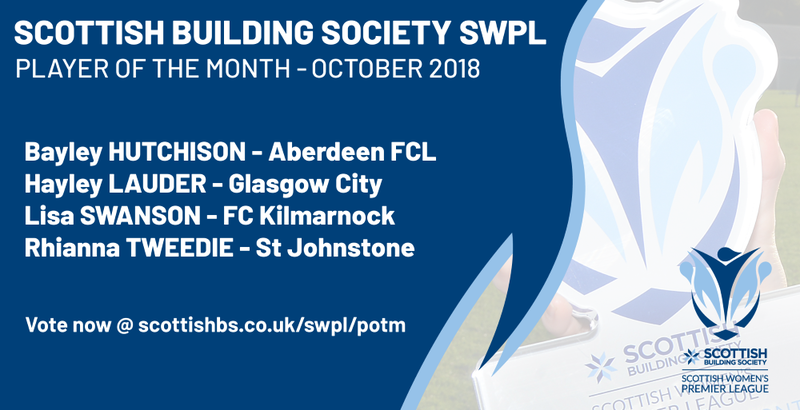 The voting for the Scottish Building Society SWPL Player of the Month award for October is open! To vote, click here. Aberdeen FCL Club Secretary, John Dickie, said: “Bayley Hutchison has had an exceptional October helping Scotland qualify for the U17s 2019 Euros and adding to an exciting end of the season battle with the Aberdeen FCL 1st team. “For a player who just turned 15 this month, Bayley has led the 1st team line since stepping up in August after the mid-season break, contributing nine goals in five games and culminating in two goals in the final game of the Scottish Building Society SWPL 2 season against Hearts. Glasgow City Head Coach, Scott Booth, said: “There are a several outstanding players playing in Scotland and Hayley is right at the top of that list. “Each season she excels and produces moments of real quality seldom seen in our game. Her all round individual technique is unquestionable but it’s her ability to bring others into play or assist in scoring that makes Hayley a fantastic tem player. “Her standards are set right at the very top. This means she is probably the best trainer on a consistent basis at Glasgow City. That is saying something because the experience and quality on show four nights a week is incredible. 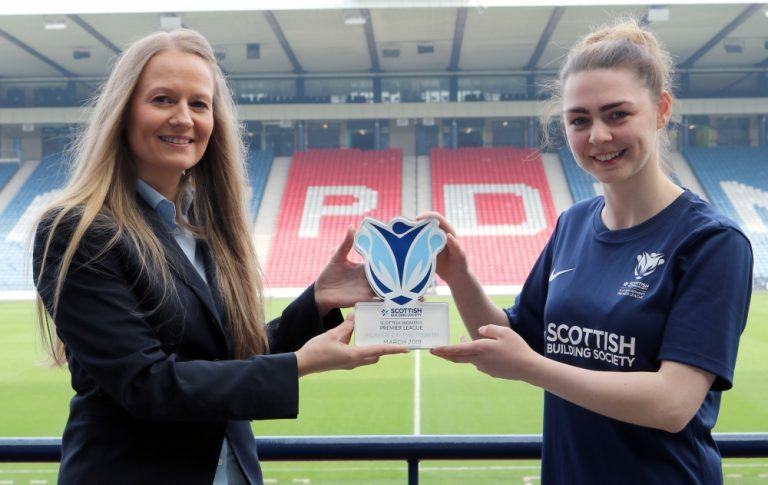 FC Kilmarnock Head Coach, Stewart Hall, said: “Lisa has grown in confidence every week and now has finished the season with eight goals and six assists. She’s a natural talent and is showing why she is one of the most sought after strikers in Scottish football. “She has been a big driving force that helped Kilmarnock finish second in our first season in the Scottish Building Society SWPL 2 and she been a role model for young players. This is even for kids who are looking to start playing. “She deservedly won September’s Player of the Month and she deserves the award again for October”. Rhianna Tweedie finished the season strong for St Johnstone, playing a full 90 minutes in both games. This included a closely-fought 2-2 draw with FC Kilmarnock and while they were defeated 5-1 away to Motherwell, she got the only goal for her side. Tweedie was vote Player of the Match for St Johnstone in their final two games and was also voted by the opposition in their final fixture of the season.